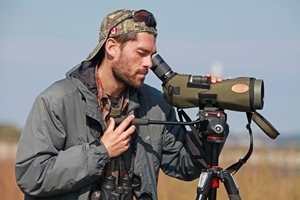 In my opinion, clinal and natural variation obscures subspecific assignment of out-of-the-ordinary birds seen during migration. If/when tempted to assign a darkish presumed migrant among ‘typical’ ones, a cautionary prefix such as “possible” is essential (which, before today’s study, I did not fully believe was required). Here I provide a faint, amateurish echo to what Rand (1948) states in his findings with regards to bird species that offer examples of continuous individual variation. What I also found fascinating is that across the entire span of seemingly endless swath of boreal forest from James Bay east to the Labrador peninsula, birds typical of T. m. nigrideus can be observed (see Figure 2). Interestingly, birds typical of southern Ontario T. m. migratorius can also be found breeding in the high-northeast; this is true of even Labrador peninsula breeders. I did not observe breeding birds from southern Ontario that approached ‘classic’ T. m. nigrideus in appearance, however, I encountered moderately-marked T. m. migratorius which comfortably overlapped in plumage with weakly-marked breeding birds from Newfoundland and Labrador. I reviewed other subspecific features of purported note, such as the extent of white to the outer rectrices (Aldrich & James 1991) but was unable to find consistency in this field mark. Several ‘typical’ T. m. migratorius showed white tail spots larger than richly-marked high northeastern birds; there was a high degree of overlap in this feature in the sample I studied. Figure 1: From left to right: adult male from Northumberland Co., Ontario, collected on 20 April 1984. CMN # 87461. 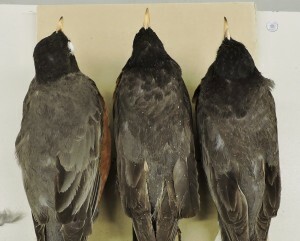 The middle bird is an adult male from east James Bay, Ontario, collected on 29 June 1950. CMN # 37294. 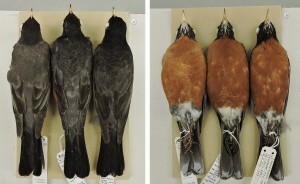 The rightmost bird is an adult male from south James Bay, Ontario, collected on 2 July 1960. CMN # 37283. Figure 2: At left, an adult male from the mouth of Moose River, Ontario collected on 16 June 1949. CMN # 36876. 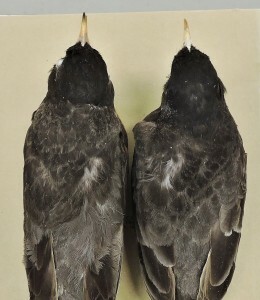 At right, an adult male from South Brook, Newfoundland, collected on 28 June 1949. CMN # 35091. Figure 3: From left to right: adult male from Northumberland Co., Ontario, collected on 20 April 1984. CMN # 87461. The middle bird is an adult male from km 388 along Route de Caniapiscau, Quebec, collected on 22 June 1983. CMN # 80196. The rightmost bird is an adult male from Schefferville, Quebec, collected on 4 July 1977. CMN # 66106. Figure 4: Two examples of “Black-backed” American Robins, photographed in the southwest end of Ottawa, Ontario. Each April, I visit a small park near where I live. There is plenty of sumac in this damp wooded area, and it is loaded with tangles and shrubby undergrowth. I have seen two “Black-backed” here; one on 28 March 2016 (at left above) and the other on 6 April 2015 (at right). Both birds were loosely associating with the other robins in the flock and were extremely skittish while the others could care less that I was standing, partially hidden, within 20 m of them as they foraged. Thank you (once again) to Michel Gosselin of the Canadian Museum of Nature for kindly granting me access to the study skins. Aldrich, J.W. and F.C. James. 1991. Ecogeographic variation in the American Robin (Turdus migratorius). Auk 108: 230–249. Rand, A.L. 1948. Probability in subspecific identification of single specimens. Auk 65:416-432. Manning, T.H. 1952. Birds of the west James Bay and southern Hudson Bay coasts. Bulletin 125. National Museum of Canada. Ottawa. Todd, W.E.C. 1963. Birds of the Labrador Peninsula and Adjacent Areas. Carnegie Museum, Pittsburgh, Pennsylvania, and the University of Toronto Press, Toronto, Ontario.